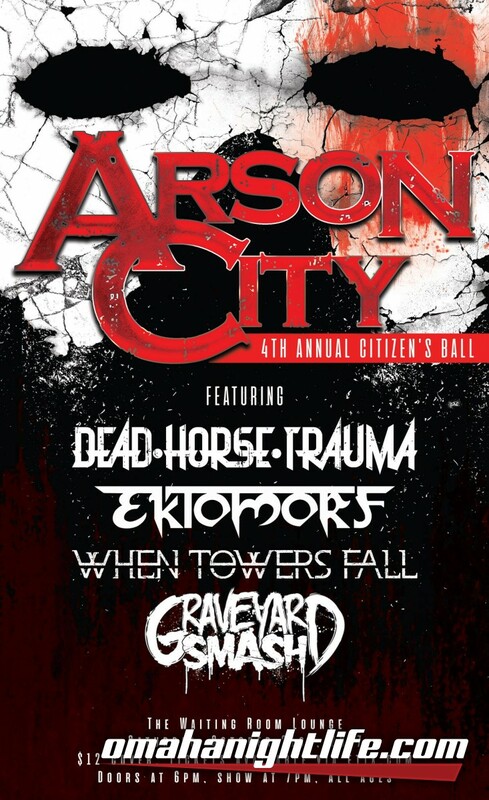 It’s October, so you know what that means: it’s the 4th annual Citizens Ball for Arson City and their fans, the “citizens”! This was finally my first Citizens Ball after all these years of knowing the band, so excited was an understatement. What an awesome bill and an cool event to attend. Highly recommend adding this show on your list of Halloween parties. Graveyard Smash was the first band up. I’ve know Billy Peck from his other band, Before I Burn, so when I heard he started a horror punk band, I was intrigued. If you like horror punk reminiscent of the Misfits, then this is the band for you! Brandon Voorhees, guitarist, is probably the hardest downpicker in the scene, makes sense since he worships Doyle from the Misfits. Billy slayed on the catchy backing vocals. Dale Steinhoefel, in true punk rock fashion, played loud and fast to a catchy beat. Lawrence Deal made the vocals his own, not sounding like a Danzig rip off. Good start to the night! Next up was When Towers Fall. I have seen this band for three times in the past four months and they never disappoint. I can’t say enough things about them. Derrek Sammons is one of the best vocalists in the scene, blending his clean and unclean vocals perfectly. Ryan Hubbard and Cavan W Short chugged and shredded their guitars. The rhythm section of Jay Stoa II, bass, and Ian Waters, drummer, was tight. The neon face paint really worked for the Halloween aesthetic of the Citizens Ball. And, of course, at the end of their latest single, “Promises, Promises”, they put on their farm animal masks on, ending their set on a comedic note. Another awesome set by one of my favorite local bands! Next up was Hungary’s own Ektomorf. They reminded me of bands like Sepultura, Soulfly, and Machine Head, that groove-infused metal sound. I would consider them the outliers of the bill, might’ve been a little too heavy for the hard rock crowd, but nevertheless they still killed it live, even starting a mosh pit. Zoli Farkas’s vocals were brutal. The drumming of Jaksa Róbert was fast, heavy, and powerful, even bumping up the tempo on their songs. Tomi Schrottner killed it on the backing vocals, with his dreads flying in the air as he headbang. Szabi Murvai chugged away on the bass. Solid set from Ektomorf. It was a pleasure to have them come to Omaha, and I hope they come back soon. The direct support for the night was Des Moines’s own Dead Horse Trauma. This was my first time seeing them live, as I’ve noticed that they have a good following in Omaha. I consider them as Des Moines’s version of Arson City, both have lead singers with dreadlocks and both play nu-metal influenced hard rock. It was cool seeing people singing along to their songs. They were very energetic in their playing. They released a new album earlier this year called, Life, that I recommend that you should check out if you like some good midwest hard rock. Awesome set by Dead Horse Trauma. I would definitely check them out the next time they’re in town. Finally, it was the band everyone was waiting for, Arson City. This was my fifth time seeing them live, the third time this year alone, and they never put on a bad show. I was really impressed with Patrick Michael Wilson’s face makeup that he had on that night. He kinda reminded me of Billy from the movie, Hocus Pocus, with the pale white zombie undead look. The beginning of their set was new material that they will put on their upcoming album, which sounded really promising. But the highlight of the night for me was the debut of a new cover song, Journey’s “Separate Ways (Worlds Apart)”. I must say I was impressed that they could cover Journey and make it their own, which I applaud them. They played all the fan favorites as well, with everyone singing along. There was even a three song encore, ending their set with “The Horror Show”. I love how Arson City likes to push the envelope, always trying new things, while still pleasing the fans. I hope their next album tops the last one and that they trajectory towards nation wide recognition increases as they are solid musicians and should totally deserve it.